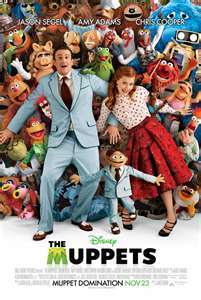 This entry was posted in Entertainment, Family, Holidays, Kids, Parenting, Uncategorized and tagged amy adams, childhood, funny, holiday, jason segel, laugh, movie, muppets, warm. Bookmark the permalink. My husband has been wanting to see this as well. Will have to put it on my list of “must sees.” Thanks for sharing! It really was awesome and I’m so glad we were able to take the kids. I didn’t grow up with The Muppet Show, but I saw plenty of the movies as a kid. The Muppets did not disappoint. I thought all the cameos were hilarious.